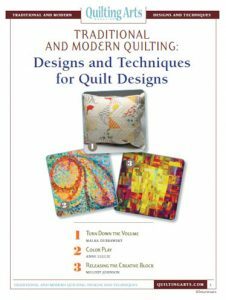 The Quilting Arts website, QuiltingDaily.com is sharing all kinds of free downloadable e-books to help you hone your skills or stitch up a new project. Just sign up for free with Quilting Arts to download any of the free e-books and have access to expert tips and advice, and to interact with other Quilting Arts members. We happen to love free quilting e-books, and here are three of our favorites! Sometimes all you need to get acquainted with quilting is a little practice, and what better way to practice than to quilt a bag? It’s a small enough project that you can finish it easily but big enough to give you some practice quilting. Get Pretty Purses from Melanie Testa, Classic Evening Bags from Susan Brubaker Knapp, Mini Messenger Bags by LuAnne Hedblom, Easy & Elegant Quilted Bag from Linda and Laura Kemshall, and the Artful Eco Bag from Kelli Nina Perkins. There’s no better gift for a brand new baby than a handmade quilt stitched with love! 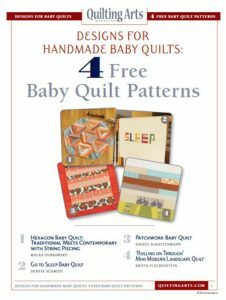 In Designs for Handmade Baby Quilts: 4 Free Baby Quilt Patterns from Quilting Arts, you get four contemporary baby quilt patterns from the easy to intermediate. You can choose fabrics similar to the ones our artists did, or adapt the color schemes and motifs to your own (or the baby’s) taste. Free-motion stitch all over the design or simply stitch in the ditch to quilt. Either way, you will end up with a baby quilt that will be a welcome addition to any nursery and may become an heirloom for generations to come. At first glance, the worlds of contemporary and traditional quilting don’t seem to have much in common, other than fabric and thread. But of course, modern quilting has its roots in the traditional methods. And, in fact, many contemporary quilters began as traditional or Victorian-style crazy quilters. This free e-book gatheres techniques and tricks from both worlds to help you design your own quilt using some basic principles in new ways. 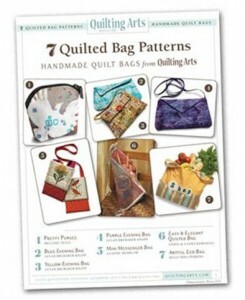 Be sure to visit QuiltingDaily.com and sign up to see these and many more free e-books and other sewing and quilting resources, too!